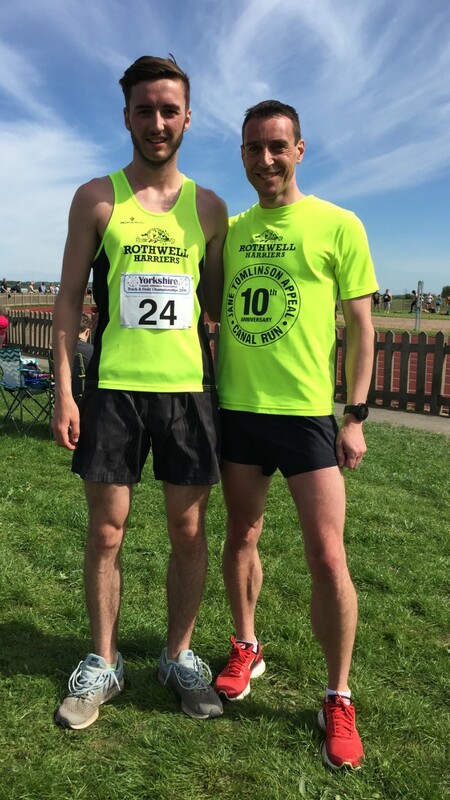 Seniors News 2018 – Rothwell Harriers & A.C. If you have any queries, don’t hesitate to ask Paul Brown, Jo Heseltine, Keith Pailing or Paul Howard. This league is all held at the York University Track throughout Spring and Summer on either a Saturday or a Sunday. Many of our juniors compete here and last year a few new senior faces raced too. This league is great for both the inexperienced and seasoned campaigner and so don’t be put off by any of the previous results. Here is a link to the website YTFSL and it’s all enter on the day. You can choose to enter the full league, or simply enter one event on the day. For more information, don’t hesitate to ask Hadrian Knight, Jo Heseltine, Keith Pailing or Paul Howard. The junior section of the club fielded 4 junior athletes at the county championships this year, 3 of them won a medal and a place on the podium; Harvey Norden – Bronze in U17 3000m, William Randall – Bronze in U15 800m and Joe Smith – Silver in U20 400m. William’s younger brother James was an agonising 4th place in the U13 Shot Putt. I decided a month or so ago that I fancied having a go at a 10,000 metre race on the track ,so remembering ,id seen a series of 3,000 ,5,000 and 10,000 metre races run by Barnsley AC called the Dorothy Hyman winter track series, normally run in January and February. I got in touch with them. I’d missed the dates for the 3 and 5k, but the 10k was still to be run. So a week later off I set down the M1 on a cold and damp Wednesday evening to run the longest track race available. What some people might think is a mind numbing 25 laps round and round a 400 metre track, but I was quite looking forward to it. I collected my number and paid my £3 track fee and went to get changed, as id never run more than 1500 metres in spikes I decided it was best sticking with my normal road shoes as my calves couldn’t take running over 6 miles on my toes and I wanted to be able to walk the next day. As we warmed up I asked some of the other competitors what sort of time they were wanting, hoping to find someone around the 38 minute mark who could help pace me, no such luck. So spot on 7pm the starting gun went off and 19 runners of all abilities set off on this 25 lap marathon, after a couple of laps it was obvious the guys at the front were going to be far too quick for me, so I tried to stick to my game plan of doing 92 second laps, after a mile or so I was stuck in no man’s land a big gap in front and also one behind, so to keep my focus I picked out runners who were behind me and tried to lap them, this worked and helped me grind out the laps, then this fleet footed runner came flying past me, yep I’d been lapped, this was something that this guy (who won the race) did to me 3 times over the course of the race and he wasn’t the only one 5 others lapped me but thankfully only the once, anyway the laps were ticking over and I felt good, I went though half way (5k) in around 19 minutes. but then noticed my pace was dropping a bit, now when this happens on a road 10k, I can usually use the uphill and downhill bits to get my pace back in line, but on a flat track you don’t have that option, then around lap 18 I realised I was pulling a bit back on the guy in front of me and thought sod it lets try and catch him and used him as my pace maker, with 1000 metres to go I was right on his shoulder, then with 2 laps to go I made my move and passed him hoping he wouldn’t respond and battle it out with me, he didn’t! I really pushed the last 400 knowing a good last lap would take me below the 38 minute mark id set myself, it did I crossed the finish line for the final time in a more than happy 37:53.7 After shaking hands with my fellow competitors and clapping the other runners in then doing a bit of a cool down I went and got some warm clothing on. On my way to the car I went for a final look at the floodlit track and realised I’d missed the group photo, gutted! I would say the 10,000 metres is more about staying focused than any of the shorter track distances and might not be everyone’s idea of fun, there’s certainly not as much to see as there is in a road or trail 10k but it does make you feel mentally stronger and it’s a great event for working on your even pace. Anyway id recommend having a go at track racing to anyone, it’s the only kind of racing where you can see how quick the fast guys at the front go as well as being able to see the not as fast ones behind you all the time, so you always feel part of the race. There’s a multitude of distances from 100 metres up to the 10,000 metres, and a host of meetings normally from the spring all the way through to autumn taking in low key open meetings up to county standard races and beyond. If the race report has sparked an interest in track racing for you, please see me at any training session and I’ll let you have more information on how to get involved. A lovely sunny autumn morning starting on the track at Spenborough 11:02 am as they held a 2 minute silence for remembrance Sunday, luckily it was warm! One and a half laps round the track initially to spread everyone out and then out into the car park through a small industrial estate and then the climb begins…..shortly into this we got a breather as a fence appeared a bit of a queue to get over it so a few of us headed under it and gained a few places (for a while anyway) over a muddy field then onto the road for more hill! Then onto more muddy fields and a golf course jumping over ditches, onto some woods then back through car park and onto the track for the final 300 metres to the finish – hooray. Within the track building there were showers, food, prizes for the first 3 in each category, and spot prizes. A really good atmosphere it seemed like everyone had enjoyed the Race. Each year YVAA put on a series of about eight races usually multi terrain distance 5 to 6 miles and call it a Grand Prix. They are mainly in the West Yorkshire area. Rothwell Harriers affiliate to this so anyone wanting to do them can take part as long as you are aged 35 plus. You can do as many or as few as you like. You get points for each race and there is an annual prize giving so the more you do the more chance you have of winning a prize. Cost usually £5 and entry on the day. YVAA also hold various Championship events during the year ie 5k 10k half marathon, cross country, track & field etc. For these pre entry is required but the info and forms will be on the website www.yvaa.org. You don’t need to be fast to do these races, you just need to be over 35. Anyone requiring any further information I’m at the club most Tuesday’s an Wednesday’s. Soo I was asked to write a race report on my first Leeds half marathon. Here I go! Race day!! The atmosphere in Leeds was electric right from getting out of the car, I was super nervous all morning but been with some fellow harriers and other running friends the nerves were easing a little. The standard selfie before the start was taken and my before race ritual of listening to Elton johns tiny dancer was over and we were on our way! I plodded along soaking it all in then came to the first slight incline what so many people had told me about…meanwood road! So the first test was upon me to tackle the hill without stopping, it wasn’t too bad to be honest and by 3 mile the legs were feeling really good then I turned the corner and was faced with the mother of all hills…Stonegate Road. I was running along remembering the advice id been given by my club members “use your arms” “don’t look down” “concentrate on your breathing” Now this may shock some of you but I loved it, the feeling of achieving a hill that has defeated so many people around me was insane!! Next thing I know I’m turning into a residential area with lots of support on the street…..the second hill had been completed with a massive grin on my face! My next experience wasn’t a good one!! Id still not stopped running when I came to a very steep descent (everyone loves a descent…right??) I had to stop! My knees felt like they were going to explode, I had never had so much pain running down a hill before. The support at the bottom was fantastic….i had a gel shot n i was back on my way. A road sign – Leeds city centre 4 miles! Woo hoo i was on the home stretch, the good old interesting kirkstall road. Really wanted to push the last few mile, we all know the scenes on this road, people digging in and using their reserve tanks wanting the end to be closer. I arrived at the court house, again the support was immense. Saw a friend on the last corner and gave her a massive grin and a thumbs up then turned the corner to see the finish line in sight! 2hr 25m later it was over and I looooooved it!!! Well what can I say about the now famous Temple Newsam Ten, I did the race in 2016 (the first ever TNT) when I was new to running, I was scared and nervous at the thought of a 10 mile trail race, it was a really cold morning and really icy on the course but as I warmed up on the course I thoroughly enjoyed it and hoped to do it again . So January 2017 arrives and it’s time for the 2nd TNT, not as cold as the previous year but cold and foggy. I made my way to Temple Newsam with a fellow Harrier, we got warmed up in plenty of time saw the previous winner (Mark Smith) at the front warming up looking ready to win it again (and he of course did) GO ROTHWELL! It was really good to see a lot of harriers at the start line, I find it’s nice to do a race with other members of the club and seeing them around the course gives you a lift and at the same time you can spur them on and hope they’re enjoying it too. Everyone on the course seems to be really enjoying it ,I personally like the fact it’s local too and has a small part of the Temple Newsam parkrun in it, it’s certainly a race to get you going for the rest of the year and if you fancy trying the PECOS out this is really good training for those. So for the first time in 2017 the yellow vest is out and safety pins at the ready. That must mean only one thing – Race day! Getting up in the dark on a February Sunday morning to drive to Dewsbury we must be mad. So why do we do it? This wasn’t a particularly memorable race for me time-wise personally so you may be thinking why have I decided to write a report on “one of the most boring 10k routes?” (overheard by a local this morning) It’s more of a reflection as to why we do this to ourselves and how we feel afterwards that makes us continue to do this sport we all love. Dewsbury 10k is organised by Dewsbury Road Runners and appeals to people because it is a fast and flat out-and-back course. Not sure I agree with the flat part entirely – more of that later! The race director welcomed everyone with his Yorkshire charm warning us that the roads had to be partially opened in places so to be aware of drivers that perhaps may not be as considerate as they should be to runners on THEIR road heaven forbid for a short period of the morning which may slow them down momentarily! Unfortunately, there was a fatal accident on part of the route the day before where Hamida Bai Dana was struck by a car and tragically lost her life. The organisers respectively asked for a minutes silence and sent condolences to her husband Musa Dana. This was followed with a round of applause from the runners and spectators. I digress, 9 am and we were off! This would be the first time I had even run 10km following illness after Christmas in the new year I’ve had to slowly build my distance up over the last couple of weeks so my aim was just to do it and more importantly enjoy it. Sometimes you are competing to beat your own time or sometimes competing against the voice in your head telling you you can’t and need to stop. Ultimately you are only competing with yourself. The first 5 km is a slight incline up Bradford Road towards Birstall. Having done the race the previous year I was looking for visual things to hush that voice that I mentioned earlier. “I don’t remember Lidl being so close to the start” I thought. “Great, that means when I come back I’m near the finish line” Next thought “Red Brick Mill – ooo that’s where we had that yummy cake and going afterwards. What cake am I going to have today?” Before I knew it we’d passed Tesco, then Aldi and lots of enthusiastic marshals cheering us on. Any distraction from that voice to keep those feet moving. At 3.5km (for me) the leading runner passed in the opposite direction. Great I’ll start seeing fellow Harriers soon I can look out for them and cheer them on and vice-versa. When a fellow Harrier said I was nearly at the turning point I was relieved as I knew what was coming…we’d just spent 5 km gradually going up, it’s got to come down! So this time I was counting down all the places I’d spotted on the way up but in reverse order. Checking them off my list rather than kilometres seemed to keep me going today. The marshals were getting even more encouraging as I went along. Hearing one say a few choice words about a car that had ignored the road closure signs made me chuckle! At 8.5km I saw a Wetherby Runner walking so tried to get him going again. Another distraction for that voice too! We had a bit of a chat and he got going. I said I owed his club because it’s their fault I started running. Signed up for a charity race and the rest is history! The cake was in sight as I passed Red Brick Mill. There was only one more thing on my list before the finish line! There it was in the distance! Time for one last push! So, Dewsbury 10km in a nutshell 5km steady incline then 5km downhill out-and-back to the finish with friendly marshals with a very Yorkshire sense of humour. Not forgetting the cake I’d been promised at the end. Did I beat my PB? Nowhere near, BUT more importantly I beat that little voice in my head and saw lots of Harriers achieving great things too. “Running teaches me that I am capable of so much more than I ever imagined”. Its 7.30 Sunday morning and time to get up, its race day! I’m already on to a winner as we’d decided to stay over in Scarborough rather than get up at the crack of dawn to get here and with the clocks going back it’s a double bonus- 9 hours sleep, I’m ready and raring to go (kind of)! We make our way down to the Scarborough Spa where the race both starts and finishes, and where you can drop your bags. There’s also plenty of toilets inside which makes a change from the usual chemical toilets we’re used to on race day. It’s also worth a mention that the Scarborough park and ride bus drops right near here so it saves trying to park in Scarborough if you have driven over. It’s an unusually mild day for the end of October and there is zero wind, perfect weather for a run on the sea front. After an obligatory pre-race selfie for social media purposes then it’s time to line up for the start. There are 1625 runners for the main 10k race which is a good number without the overcrowded feel you get from some of the bigger events. There is a little bit of a bottle neck at the beginning when the runners head out from the spa but this soon thins out when you run down to the seafront and you can settle in to a steady rhythm. The route takes you along the seafront and round the headland to the north shore. Once you get to Peasholm Park it’s about 4ks and there is the race only drinks station, the route carries on through Peasholm Park and then doubles back on to the seafront again and back to the finish. The slight incline up to the finish does hit a bit though with tired legs! The pain is all worth it through for a nice bit of bling and one of the nicest technical T shirts I’ve had to date! The main race is then followed by a family fun run which is great for the youngsters and means you can make it a proper day out to the seaside with the whole family. With the great atmosphere, bling and t-shirt not to mention the cracking fish and chips after, the Scarborough 10k remains one of my favourite races. That first Wednesday evening I was a bag of nerves. I couldn’t get parked at the sports centre, and when eventually did I was late. As I entered to sports centre, the sight of 50 plus harriers charging down the stairs towards me, made me turn back to my car in terror. Luckily, Matt saw me, and caught my arm before I could get far. There were around 5 of us including Matt on that first session. We didn’t go far, around 2 miles. I ran and walked it, I felt under no pressure when I needed to walk, which was most of it. And I loved it. The sense of achievement I felt, that I had been out running with a proper club, and nobody judged or sneered at me because I was overweight, and very slow, and that I had RAN some of it, was amazing. I came back the following weeks, and loved it even more. It took me 9 months to pluck up the courage to do my first parkrun (March 2013), and another 8 months for my first 10k (Leeds Abbey Dash Nov 2013). In September 2014 I volunteered to marshall at the first Vale of York HM, I really enjoyed this, and did so the next year. However the second time I couldn’t help thinking, “I wish that was me” as the runners went past me. In the spring of this year, I was persuaded by my fellow harriers, the lovely Emma Bird and Karen Thompson, to sign up for this year’s Vale Of York HM. I was thinking next year to give me 18 months to prepare, but before I knew it, I’d signed up for 2016. I went to meet my sister in Grantham later that day. travelling down the A1 I saw a sign: Grantham 13 miles. I nearly cried when I realised how far 13 miles was. The day of the HM arrived. I felt physically sick, forcing myself to eat some shredded wheat and fruit for breakfast. I was so worried as there was a cut off time of 3 and a half hours. Unfortunately they delayed the start due to traffic jams, so our time before the roads opened was reduced even more. I was determined not to let this worry me, as we set off. It was a beautiful sunny day, and to start with there were 6 of us. Denise, Karen, Emma, Christine and myself from Rothwell Harriers, and Steve from Ackworth Road runners. We had a lovely run for the first 8 miles, beautiful countryside, people cheering along the way, nice houses, great marshalls. I loved it. By mile 8 there were the 4 of us together, Karen, Emma, Christine and I. This is when I started to struggle. I couldn’t get my feet to run more than a few yards, so we used trees for targets. Run to that tree, and walk to the next. Mile 10 and it was the last water stop where the traffic England guy told us he would open the roads at 1pm and we would have to get in the support vehicle. It was 12.40pm. Well Emma was having none of that. “They told us we had 3 and a half hours, and that is how long we will take, the traffic will just have to go round us!” She told him assertively. The Traffic England guy looked quite scared. At mile 11 I had a bit of self doubt and got quite tearful. “I can’t do it, I’m going back to my car” I wailed. Emma pointed out that my car was probably further away than the finish line and we were going to finish, end of! By now it was just Emma and I, as Karen was supporting Christine a few yards in front. Paul Howard joined us on his bike from mile 11, which was great. Running, walking, crawling up the drive to Sherburn Airfield where the finish was, I was being dragged by the hand, by Emma, like a naughty child is around the shops! Looking back, I was vaguely aware of a few more people supporting us on bikes. I could see the 13 mile marker, and I remember thinking to myself “Pull yourself together, you do not want to cross that finish line crying” so I dried my eyes. Just past mile 13, I spotted my parents who had come as a surprise to see me finish, so the tears came again as I crossed the finish line. WOW! What an incredible feeling. I had completed my first Half Marathon in 3 hours 28 minutes and 12 seconds. This article shows what a great club we are. How everyone is so supportive of each other, and I’ve never felt judged, even though I am one of the slowest, probably the slowest in the club. I am so grateful to you all for encouraging me over the years. In particular Matt, who has the patience of a saint, and to Emma and Karen for all their help in my HM training and the HM itself. “Of all the Club Runs I have done in my 14 years membership at the Harriers, this was one of those I have enjoyed the most. On a couple of occasions I have done the Golden Mile at Oulton School with Jason Westmoreland and always wanted to know how fast I could run a mile being 14 ½ stone and 50 years old. Last year I did it in 7mins 40 seconds and this year in 7 minutes 50 seconds but always felt that I could have run better on a track and having attended speed sessions on Tuesday nights and training for the Yorkshire Marathon I believed I could achieve a personal best. The Leeds Beckett University complex is in lovely surroundings and the weather was kind to us on Saturday. I was placed in the first race with 8 others and was a bit nervous but had great support from fellow Harriers Alison, Jon and Jo cheering me on. To my surprise, I won my race with an official time of 7 minutes 19 seconds and won a bottle of wine for my trouble. Never won a race before !! It was great to watch other Harriers running in their heat and others winning theirs as well with nearly all of us achieving their personal bests. My only regret was not being able to stay till 5 p.m. to watch every Harrier run. This event is also a great opportunity for fellow Harrier runners to increase their points score in the championship as it bumps up their scores due to it being fast and flat. Lisbon Rock and Roll Half Marathon. 2 October 2016. My first taste of an overseas race was Amsterdam a year ago and I instantly loved the unique buzz. Cheers of ‘Allez, Allez’ from the extensive crowd that had turned out on a cold and foggy mid October afternoon in the Netherlands. You could pick out the Brits amongst the competitors and instantly had a connection with them. You were here for the same thing – the experience of running away from home soil, the sounds and unfortunately smells of runners from a wide variety of countries and the opportunity to explore a major European city before and after the event. Having enjoyed the experience the Rock N Roll series in Liverpool earlier in the year the natural choice for another crack at running overseas was Lisbon. There are currently four races from the USA based organises in Europe. Lisbon in October, Madrid which is usually at the same time as the London marathon, Dublin in August and of course Liverpool which is in May. The events are whole weekend celebrations of running and music with a range of races from 5Ks to full marathons taking place with music at regular intervals through the course and (in Liverpool certainly) a ‘finish line concert’. The race medals are something else and you pick up medals for each race and additional ones for combinations of races at the same weekend or over two, three, five or more weekends in different locations. The result is seeing runners after the race with so much bling around their necks they cannot hold their head up properly. What’s not too like about the Rock n Roll series then. Lisbon was a no-brainer. I booked a hotel near to the finish (which is also close to the point at which you are transported to the start line of the half marathon – more of that in a moment). For reference the district is called Oriente and is also conveniently located three metro stops from the airport. The marathon starts along the coast in Estoril so perhaps not so convenient for getting to the start for 8.30 in the morning. So onto the race itself. It starts on a bridge. The Vasco Da Gama bridge, the longest bridge in Western Europe no less! A fleet of buses pick of the 9,000 or so runners and transport them over the eight mile bridge and most of the way back again setting you down strangely on the bridge with a 1 mile walk to the start line. It’s an excellent experience and there is a great atmosphere on the buses and walking to the start line. The organisers do a great job in getting you to that point so efficiently but the problem is because it is so far to the start the last bus leaves the pick up at 9 am, which is 90 minutes before the start and once at the start there is nothing to do but wait around. In my case having jogged some of the ‘walk’ to the start in an attempt to loosen off pre-race I entered the start pen (which isn’t sectioned into completion times) and then having made the required visit to the toilet sat around in the pen. There was no room to do anything else including stretch. It was by now 25c(ish) degrees and I was sat on a bridge with no shade and rapidly depleting water – hardly ideal before 13.1 miles. Entering the pens later wasn’t the solution either, I spoke to one runner from Stockport on the flight home who had done that and could only get in at the back and consequently spent the first three miles packed into crowds far slower than his normal pace. The first 2 miles of the race run down off the bridge and are scenic and once you get moving the wind from being by the river had a cooling effect. Its downhill and there’s a water station after the first 2 miles which is helpful. Once down off the bridge and having hydrated a bit from that first water station it was time to settle down into a steady pace. Unfortunately the next 2 miles are through the Oriente business district, which is all concrete and high rise so the sun reflects of the roads and buildings and the earlier breeze has now gone and suddenly I was in trouble. My legs were tight presumably from the sitting around and my mouth was dry. I slowed the pace but my chance of making a reasonable time had already gone with 9 miles left. The first 8 of those 9 miles were so boring. Where was all the music we experienced in Liverpool? The course is essentially an out and back from here but making it worse was the fact that you were running an urban motorway through the docks! Also where were the water stops? I swear I didn’t see one for 4 miles. I actually swore a lot. I bet everyone else swore a lot too but I couldn’t understand it. I heard no English speaking runners, no-one to share my pain with, no one to try to have a little exchange with and try to get back on track by running with them. It was quite a lonely race and by now was turning into a long (in terms of time) race too. At the turn back there was the relief that is was only 5 miles back because of the bit on and down from the bridge at the start but it was that same soul destroying roadway and now a had a wind in my face but a warm dry wind. At the last mile it livens up. The crowds are back and you are back in the Oriente district. The wind has gone due to the shelter from the high rise office blocks and hotels. But by now it was after 12 noon and the temperature was 26c according the street signs. I quickened my pace to try to get this hell over with and actually felt like a fast finish may be possible until I turned the final corner and saw the surface for the finishing straight was cobbles. The final punishment handed out from a cruel course! At the end there was comfort from becoming the owner of one of those amazing medals and a very nice Adidas tech t-shirt too. But where was the finish line concert? At Liverpool we got a free beer for our efforts in Lisbon we got half an un-ripened banana and an ice-cream. This was NOT Rock n Roll, and not the same experience as Liverpool. My time was 1:50.25. My second slowest ever half marathon and probably my least favourite. Lisbon was a lovely city, but I went for the run but the run was what spoilt my weekend away. Saturday 24th September 2016 was the day both the junior and senior members of our club assembled to take part in our Olympic Sports Day exclusively for Rothwell Harrier members. A total of 25 senior members and 32 junior members took part across the 16 events on what proved to be a tremendously enjoyable day for everyone involved. The results can be found here: olympic-sports-day-results although it needs to be understood that the times and distances recorded don’t count towards club records as times and measurements are non-official i.e. not electronic timing or witnessed and verified by officials in the field. A total of 4 gold medals (if we were giving out medals) were won by Lewis Penna-Kincell (100m, 800m, Long Jump and Discus) who clearly has a bright future in the Track & Field Competitions next year. Well done Lewis. The 1000m race for all the committee, coaches and assistants was won by James Wardman in a time of just 2 minutes 42 seconds, well done James. The grand finale was a 5 x 400m relay which was won by the Pink Team who started in lane 7 and captained by Jon Schofield who ran leg 1, followed by William Randall, James Langdon, Lexie Rowing and Olivia Howard. Well done Pink Team. The winner of the 2017 Club Handicap race was Jade Johnson – congratulations!!! Well done to all those who ran in this years Leeds Country Way relay on 4th September. A great day! Rothwell Harriers & A.C. are pleased to confirm we now have 3 Qualified Guide Runners . We would love to welcome / invite prospective new members for a free taster session on a Wednesday evening . 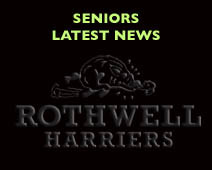 Please contact Carole Clifford e-mail address info@rothwellharriers.org.uk for further information.